Jason Dussault is part of a Guy Hepner and Avant Arte collaborative exhibition All Art Everything showing from April 9th to April 29th in SOHO. The worlds most impactful art is born from the expression of internal struggle. Jason Dussault has wielded the power of that understanding and has channelled that energy through nostalgic iconography. 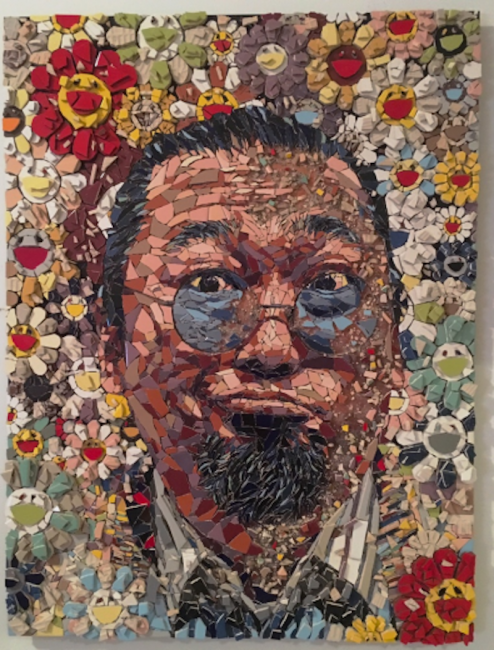 From an artistic rage that lives beneath his perception, Jason creates an homage to one of the most primitive yet connected mediums in art history, the mosaic. By combining tile, paint, grout, resin and vintage porcelain, Jason has re-envisioned a 4,000 year old craft that has spawned masterpieces and, has made it his own. A true labour of love, Jason’s pieces are created over a two to four week process which he navigates on his own accord, free from assistants or interns. His dedication, curiosity and, sacrifice have culminated in humbleness, the true mark of an artist. The blend of creativity and ethos have procured Jason a place in the Hoerle-Guggenheim Gallery, where his works are currently displayed alongside famed innovators such as Picasso, Dali, Warhol, and fellow street artist, Retna. As we gain experience, the world becomes less mysterious, as we are afforded more and more looks behind the veil. Jason has recreated subjects from his past to help him bring back the magic, excitement, and hopefulness that stimulated his youth. The culmination of symbolism and raw material transforms Jason’s pieces from one dimensional objects to works that resonate with us on a visceral level.